What Causes Dark Spots on Human Gums? Dark spots on your gums can be signs of harmless or deadly conditions, depending on its nature. Some oral cancers manifest as dark spots in their early stages. Serious gum disease can also lead to the existence of dark spots or formations on your teeth and gums. Always consult your dentist if you notice spots on your gums for a thorough diagnosis. Calculus is a hard, calcified deposit formed from hardened dental plaque, oral debris, saliva and minerals. This hard residue forms on and under the gum line, between the surface of teeth and the gum tissue. Its color can range from yellow to very dark brown. These deposits can give the appearance of spots on the gums and are an indication of dental hygienic habits and conditions that lead to gum disease. Proper daily flossing will prevent calculus buildup. 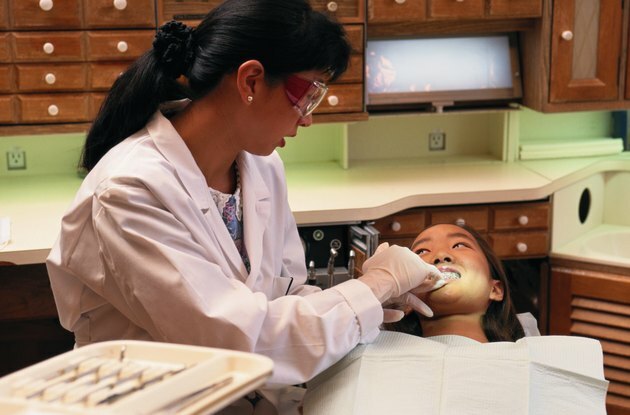 If you already have calculus along your gum line, see your dentist right away. Your dentist can remove excessive calculus deposits and assess the severity of your gum disease. If you have fillings, crowns or dentures, you may develop amalgam tattoos. These gray, blue or black spots appear inside the mouth when small particles of amalgam become embedded within the oral membranes. These spots remain the same size and have a regular, round and flat appearance. Even though these spots pose no dangers, certain oral cancers in their early stages resemble amalgam tattoos -- any new spots or discoloration should be examined right away. Melanoma is very rare inside of the mouth, but in its oral form it is most often fatal. Oral melanoma begins as a small black spot anywhere within the interior of the mouth. In its early stages, it may resemble an amalgam tattoo. As the cancer progresses, its color may be tan, dark brown or black mixed with red or gray. Its size will increase as it encompasses more of the mouth and its shape will change irregularly as it grows. Dark spots on your gums can also be caused by serious conditions such as Stevens-Johnson syndrome and toxic epidermal necrolysis. If you have a rash on other areas of your body in addition to dark spots on your gums, seek medical attention right away. What Causes Small White Bumps on Lips? What Are the Causes of Yellow Teeth in Children? What Are the Causes of a Growth on the Roof of the Mouth? What Are Little Bumps on the Lips?